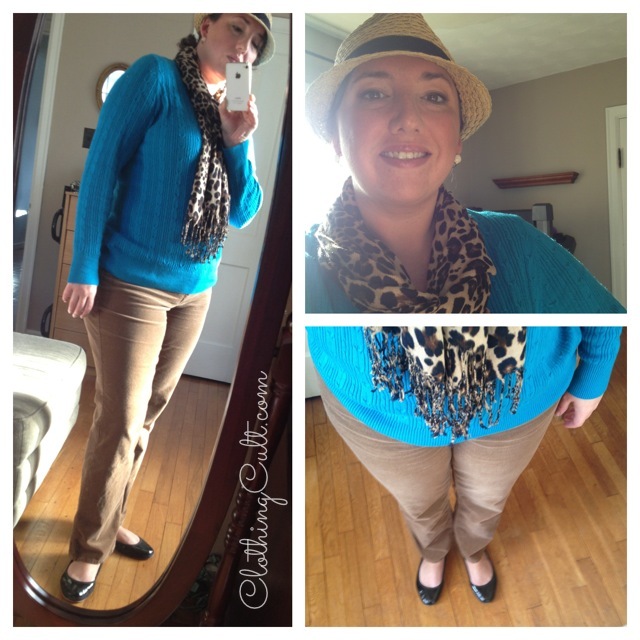 Outfit of the day – turquoise, leopard and corduroy. Actually the more I think about it the color sweater color is dead on cyan instead of turquoise. Ok so most of this outfit came from Kohl’s. I’m finding Kohl’s to be a good source of decent quality basics at a good price. I gave a sneak peak of some of these items in this post but that didn’t include the sweater. That $10 Kohl’s cash coupon I got from my online order I used to go back and buy this sweater. Actually I ended up with two of these cable knit sweaters because I liked them so much; the “bold blue” and the “brown heather”. Ok one quick note on the Uggs Antora ballet flats: I LOVE these but I have last year’s Antora not the Antora II and there is a difference. What I liked about last year’s style is that they are lined with shearling which helps keep my feet warm in winter. Not as warm as boots but better than most ballet flats. There’s no shearling on the footbed but there is shearling along the sides. If you see patent leather on the outside, there’s shearling under that. This year’s Antora II shoe however appears to only have a little tuft of shearling in the heel and that’s it.